The Patriot Guard Riders having been invited by the family of fallen US Army Veteran, Sp4 James E. Shaffer Jr, to stand and honor during his interment service at the Janesville Cemetery, Janesville, CA.. The mission involved a flag line at the Janesville Cemetery, Janesville, CA. for family and friends to pass through. On a beautiful, winter day, 14 PGR members showed to present Honors for this true American Hero, where the PGR stood Honor Line at his final resting. Sp4 James E. Shaffer Jr served our Nation with the 809th Engineering Battalion H/S Company. After serving in the US Army, Sp4 James E. Shaffer Jr. went to work at the Sierra Army Depot in the Special Weapons Unit for 26 years until his retirement. 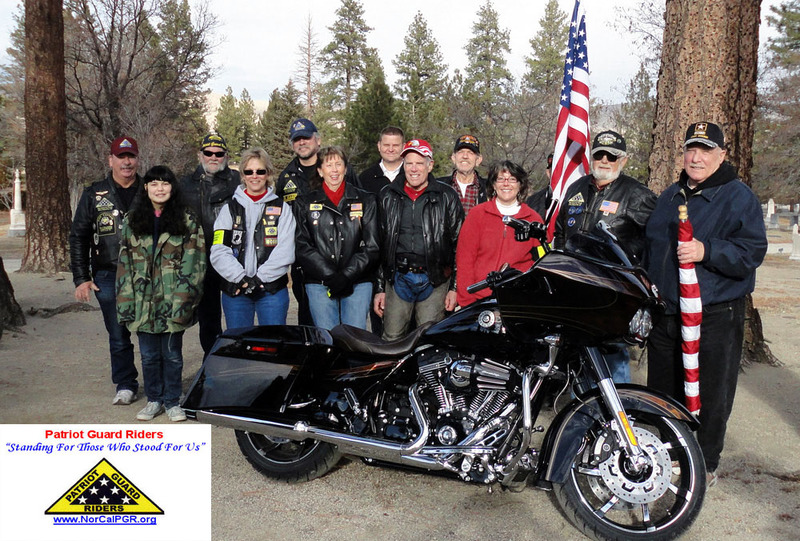 I would like to give a special thanks to Reno Nevada PGR members Dave Kealey, Dean Shuff and Kim Talburt who traveled to assist the Susanville PGR stand Honor Line with American Fags during this Mission. In addition to our Patriot Guard Riders we had a great representation of many groups on this Mission. Lastly, but not the least, I am thankful to Sp4 James E. Shaffer Jr, US Army Veteran, an American Hero, and his family. Your watch has been stood, your duty to protect this nation is complete, and you’ve earned the right to be called a true American Hero. Your service and sacrifice will not be forgotten.